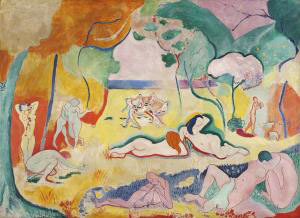 Les Demoiselles d’Avignon, (Elderfield, 217-222)but more importantly the fauvist masterpiece Joy of Life by Matisse. Nonetheless, before Matisse’s most novel and independent work can be considered, it is important to note the impact Cézanne had on him while he was still an apprentice. As Cézanne’s own apprentice, Matisse could not help but to succumb to his influence. Not to imply that he felt daunted by such an influence, because some of what Matisse had to say about Cézanne cannot be considered anything less than glorifying. 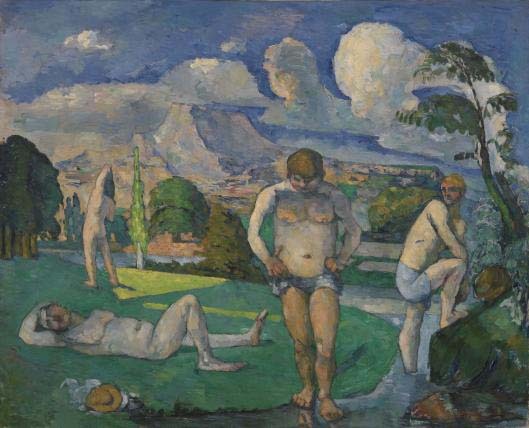 Matisse states that Cézanne is, “a sort of god of painting” and “the master of us all” (referring to modern artists) (Bois, 103). In the history of art what makes Matisse stand out is that he is the artist that put fauvism “on the map”, but even a new and radical style such as fauvism has influences (110). Components of fauvism that are related to Cézanne are most easily seen in Matisse’s early work. 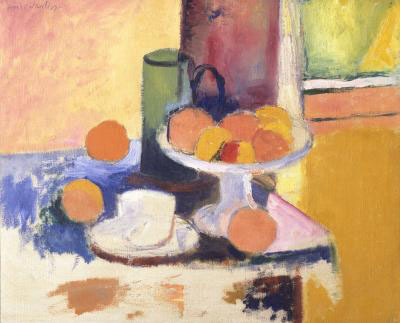 Matisse’s Still Life with Oranges II (figure 1) looks like it may very well be a painting by Cézanne but what makes this piece distinctly “Matisse” is the characteristically wild and bright fauvist colors that are used in large, flat areas (106). 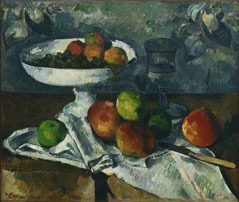 The similarities that exist can be seen when compared to many of Cézanne’s still lives, but I have chosen to compare it to Cézanne’s Still Life with Fruit Dish (figure 2). The first thing that I notice between these two paintings is that they both contain the same white dish prop. Figure 1. Figure 2. Figure 3. Figure 4.